Gold Medal Winner in College Nonfiction by Literary Classics; Bronze Medal Winner for the 2016 Foreword INDIES Book of the Year Award in Women's Studies; Honorable Mention in Adult Nonfiction and Young Adult Nonfiction. This book, filled with images, tells the stories of the virtuous virgins, marvelous maidens, and fierce feminists of the Middle Ages who trail-blazed paths for women today. Ideal for high school and college classroom use in courses ranging from history and literature to women's and gender studies. Cover depicts Judith holding the head of the evil Holofernes by Lucas Cranach the Elder. Judith inspired many authors and artists in the Middle Ages. What have a deaf nun, the mother of the first baby born to Europeans in North America, and a condemned heretic to do with one another? They are among the virtuous virgins, marvelous maidens, and fierce feminists of the Middle Ages who trail-blazed paths for women today. Without those first courageous souls who worked in fields dominated by men, women might not have the presence they currently do in professions such as education, the law, and literature. Focusing on women from Western Europe between c. 300 and 1500 CE in the medieval period and richly carpeted with detail, A Medieval Woman's Companion offers a wealth of information about real medieval women who are now considered vital for understanding the Middle Ages in a full and nuanced way. Short biographies of 20 medieval women illustrate how they have anticipated and shaped current concerns. Their legacy abides until today in attitudes to contemporary women that have their roots in the medieval period. The final chapter suggests how 20th and 21st century feminist and gender theories can be applied to and complicated by medieval women's lives and writings. Doubly marginalized due to gender and the remoteness of the time period, medieval women's accomplishments are acknowledged and presented in a way that readers can appreciate and find inspiring. Ideal for high school and college classroom use in courses ranging from history and literature to women's and gender studies, an accompanying website with educational links, images, downloadable curriculum guide, and interactive blog will be made available at the time of publication. Winner of the Words on Wings Book Award for young adult fiction, a Literary Classics Top Honors Award. Read more about the book here and to order it. [M]y understanding of waste has been greatly expanded by Susan Signe Morrison’s The Literature of Waste: Material Ecopoetics and Ethical Matter....I think her book can help bring readers to a better understanding of waste....Her final two chapters on source reduction and reuse articulate a clear vision of how poetry might help humans to see waste in all its forms as ethical matter, calling for action....Her work brings together Walt Whitman, Ammons, and Italo Calvino along with Chaucer and others in an exciting and awe-inspiring assemblage. The Literature of Waste also offers valuable commentary in thinking about intertextuality as a kind of recycling, the dangers of seeing certain groups of humans as waste, the dependent relations a city has with rural landscapes concerning waste disposal, and the pressing problem of conspicuous consumption and the often hidden increase in waste it produces. As I was trying to dig through Morrison’s midden heap of literature, theory, and history, I found myself constantly struck by poignant insights and thoughtful articulations, especially her work on early modern and medieval texts. 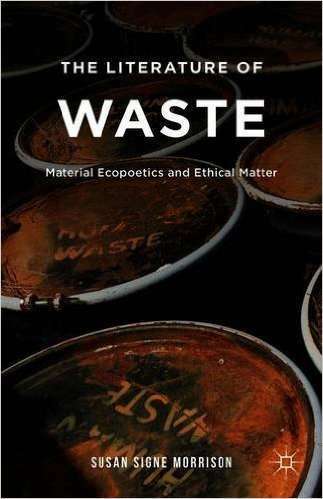 In terms of ecocriticism, the book is a great example of interdisciplinary thought that seeks to address environmental crisis.....Scholars and readers interested in material culture or any of its various offshoots will find much of use here while those interested in garbage more generally will also find this book a useful introduction to thinking about waste. Click here to explore the website for Home Front Girl, filled with images and resources. Chicago: Chicago Review Press, 2012. Home Front Girl is not only an entertaining and delightful read but also an important primary source—a vivid account of a real American girl’s lived experiences as World War II threatens and then begins. "This is a fascinating book." The first scholarly book devoted to discovering and analyzing medieval women pilgrims in history and literature. "This is an exhaustively researched and necessary study in the wider field of pilgrimage, providing new insights into the place of women pilgrims in medieval society."